Members have the chance to win up to $10,000.00. Badge draw starts at $500.00 and jackpots every week if not won with 4 draws throughout the evening first one starting at 7.30pm, 8.00pm, 8.30pm and 9.00pm. 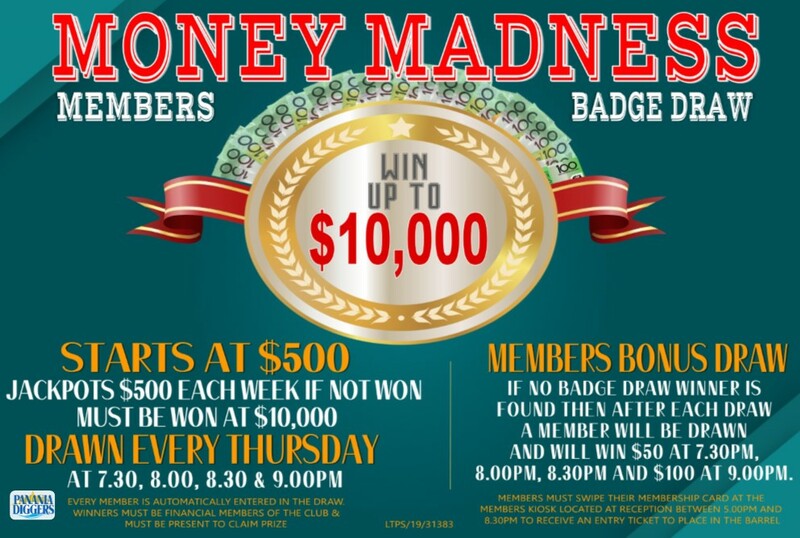 There will also be a bonus draw for members at the end of each badge draw so after each 7.30pm, 8.00pm and 8.30pm we will also draw a member out of the barrel and they will win $50 cash and after the final one at 9.00pm we will draw a member out of the barrel for $100 cash. Members must swipe their membership card at the members kiosk at reception to receive a entry ticket to place in the barrel. Money Madness draw is held every Thursday.